The smoke removal capacity of our stove does a great deal to save the 25 children per 1000 who would otherwise die of lung disease before the age of five. But there are other health issues we see in our Project villages. Safe water is a key issue. Village health officials tell us that 35 children out of 1000 die before the age of five from waterborne disease. The prevention of waterborne diseases lies in getting the pathogens out of the locally-sourced water. 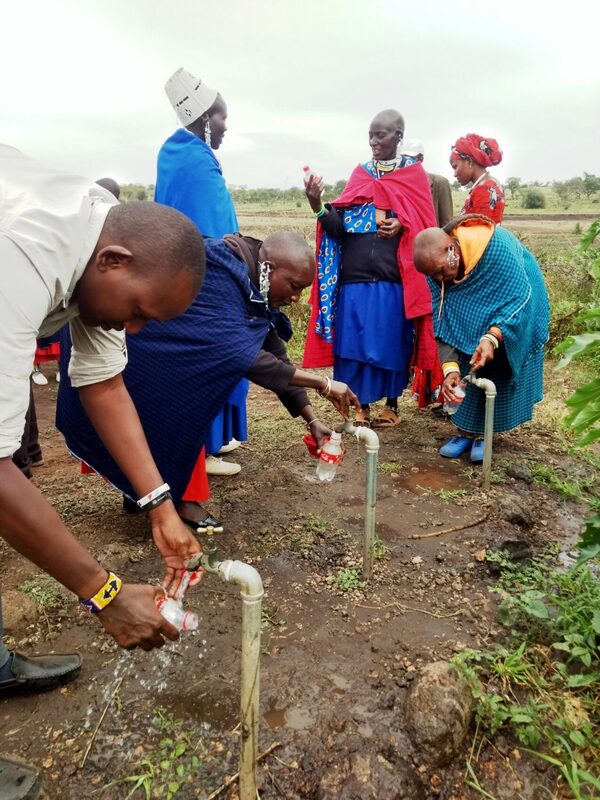 Rural women, such as the Maasai, bring this water home to their families. Water purification is one of the areas flooded with innovations and experimental programs for poorer countries. One reason for all this innovation is that many agencies think they can keep costs down by exploring new ideas. There is also a concern about problems with bacteria and parasites, as well as too much fluoride or the presence of arsenic. The ICSEE(T) prioritizes targeting the primary killers, including bacteria and other living organisms. All over the world, people access safe water through town or city chlorination programs. The International Collaborative decided to explore chlorination as a practical approach for rural communities where women gather water. We first learned of programs addressing polluted rural water with chlorination from Kate Cincotta of Saha Global.. She works with the women of Ghana. Their chlorination plan is quite different from ours, and does not produce safe water right at the source. Instead, Kate helped established small businesses for women who gather dirty water, treat it, and sell it to other women. Although the ICSEE(T) approach is different, we share the chlorination approach. Thank you to Kate and Saha Global for sharing their experience. We learned so much from you. Maasai water sources are very dirty. There are no wells. 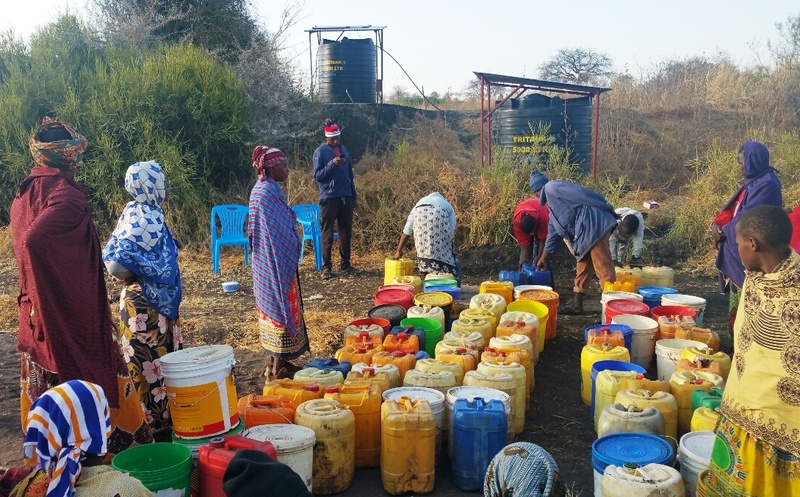 The women collect water from shallow ponds that fill the depressions that the people themselves or the government have dug out for catching rain. These ponds are polluted even where the people have been careful to keep livestock away. Rural Africa’s water sanitation needs are no exception to those solved by chlorination, worldwide. The chemical approach is preferable to other treatments, such as those using filters or radiation, because chlorinated water does not get immediately re-infected when it comes into contact with bacteria. This is because the chlorine that killed the bacteria at the time of first treatment is still there, protecting the water for at least a few days. Because there are pathological bacteria all around, this is an important consideration. Containers from home or even a child’s unwashed hands can easily re-infect water treated without chlorine. Costs are low to operate a basic silt-settling and chlorination system. The chemicals used, including calcium hypochlorite and alum are very inexpensive and readily available in Arusha, the major city nearby. The equipment, tanks, pipes, solar panels, batteries, and pump cost about $35 per family for installation. The Project shares that cost with the families that will be using the clean water generated by each system. The ICSEE(T) completed and fully tested the water system pilot program in 2018, proving it to be a practical concept.The ICSEE(T) continues to design safe water systems adapted to each water source, and to the way the local women gather and use water. The pilots began with a small pond in Mbuyuni used by 40 families. The families had worked together to enlarge a natural depression where rainwater collected. While the level changes with the season, the pond normally has water all year round. The families and the International Collaborative spent two exciting days installing the first system. 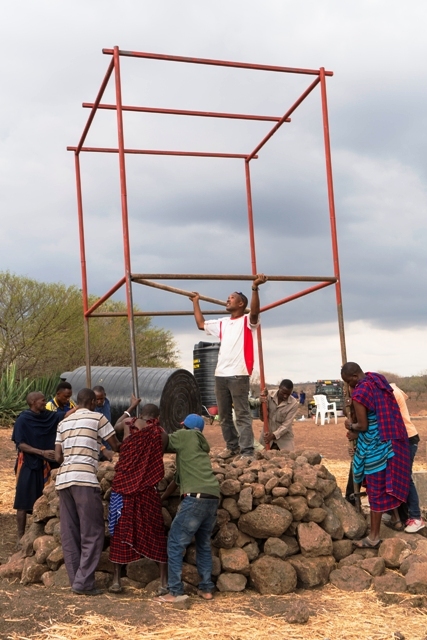 It can produce 2000 liters per day of safe water, enough for the 40 families. At this pond, the system includes a portable pump powered by a solar panel and battery. The couple managing the system fills the settling tank each evening with pond water. By morning, the alum has cleared the 2000 liters of water. The clear water is then allowed to flow into a second tank for treatment with the calcium hypochlorite, and it is stored there. Finally, a buried pipe takes the safe water to a faucet for the women. They are very happy with the resulting water and its convenience and quality. As part of the pilot, the ICSEE(T) installed four systems. Three are in the village of Mbuyuni and one at the large lake in Naiti, nearby. Together, the four provide 20,000 liters a day of safe water for 500 families. The people of Naiti want to integrate a small vegetable farm alongside the chlorination system. As long as the pumps are there, and as long as water supply is large, why not have a food source too? Why not sell extra vegetables to provide funds for ongoing operation of the water system? The International Collaborative needs additional funds to support the spread of these safe water projects. Appeals to local government and private donors are underway to work towards scaling up this essential effort. There are 220,000 Maasai in Monduli district alone and preventative medicine of this kind is urgently needed. Are you interested in supporting access to clean water in rural Africa? We welcome your gift. 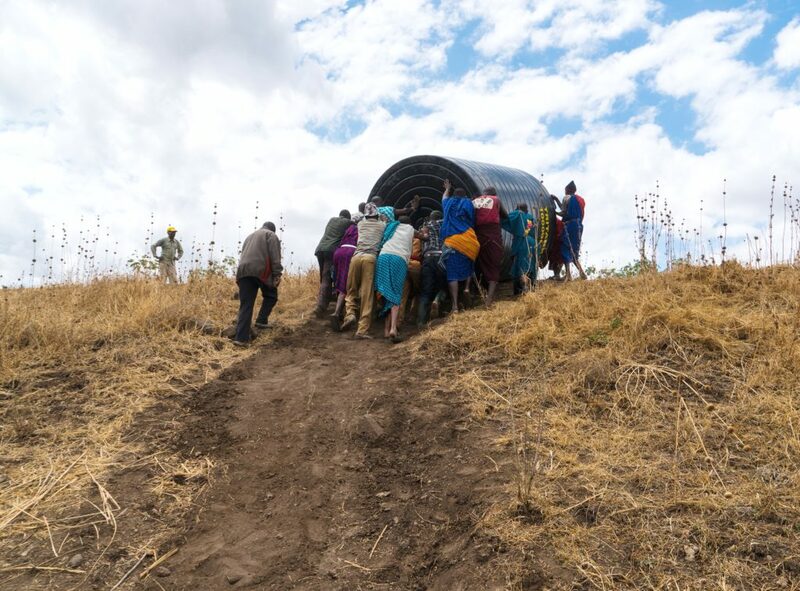 The International Collaborative is working to develop solar-powered portable pumping systems to solve problems for herders and farmers working in difficult environments. The systems use surplus military solar panels sent to us by Last Kilometer Solutions of Detroit, Michigan. We've put these together with 12 and 24-volt submersible pumps. 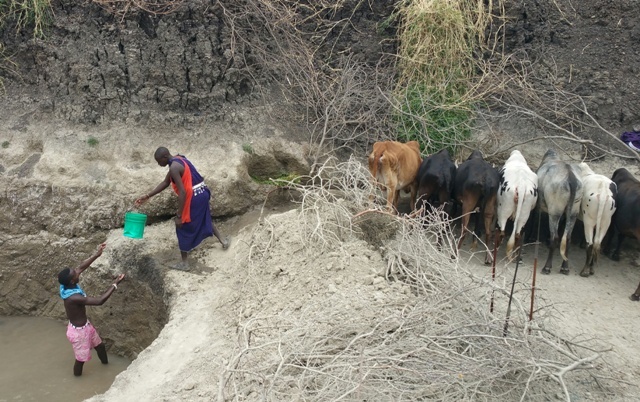 The herders need to water their cattle without walking them miles across dry terrain. 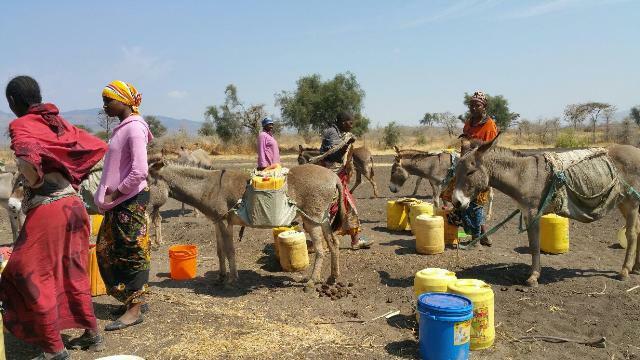 There are places where herders can dig boreholes that fill with water. However, getting the water up to the place where the animals can reach it can be slow and difficult. We are developing and testing inexpensive pumping systems. If successful, the plan is to have the herders purchase and share the pumps and hoses. The Project will provide the solar panels. When the system’s panels are not being used in the field, they can power home lighting. The portability allows for an efficient, life-changing dual arrangement. Irrigation is another potential use for the portable panels. Sometimes there is water in a nearby flowing ditch. The portable panels can power the pumps to move that water into the field. A powerful solar-powered pump fills the settling tank each evening. By morning the alum has cleared the 2000 liters of water, allowed to flow into the second tank for treatment and storage. Finally, a buried pipe takes the safe water to the most convenient water-gathering point. The women access it from a normal faucet. They are very happy with the resulting water and its convenience and quality.